Well, that time of year is coming again and if the Farmer’s Almanac is to be believed, it’s going to be a nasty winter season. But ice can be a problem in early winter and late spring too, with only June, July and August pretty much a lock against the slippery stuff. First off, plan to shovel regularly. Short of an epic ice storm, ice forms when snow melts and freezes. It also forms on snowy walkways and sidewalks that have been tamped down by so many feet going by. So the key to avoid finding yourself with that immovable slab is to shovel, shovel, shovel. Did I mention that you need to shovel? And not just any old shovelling but you need to do that ‘right down to the pavement’ kind of shovelling. If you have steps and a porch, shovel those too, or at least sweep the snow off of them. There’s nothing more treacherous for the delivery person bringing your latest order of books or shoes than slippery steps (because let’s face it, the minute it snows, online shopping becomes VERY appealing). All joking aside, your insurance company would prefer not to have to pay out on your homeowner’s policy for a slip and fall so… shovel. If you KNOW in advance that an ice storm is imminent, consider throwing a little de-icer down in advance. It will prevent the ice from fully forming a solid base and will make it easier to clear after the ice-apocalypse. If you skipped my introduction just to get to the meat and potatoes of this post, go back. You don’t want to end of in the same snow vs. shovel dilemma that I did. As the weather starts turning colder, dig out your implements including your standard shovel and sharp edged shovel or ice chipper, de-icer to throw down and a bag of sand if you need some traction on a difficult section. If you’ve got a snow blower, make sure it’s in working order and that you’ve got enough fuel for at least the first few storms of the season. You don’t want to be caught short with no snow blower fuel AND being late for work, in the bargain. If you use a manual snowblower (ie. a shovel), make sure you have cocoa on hand for re-fuelling yourself. With mini-marshmallows. Be sure to store your winter tools and de-icer products where you can get at them: not in a shed or outside box that can effectively be iced shut. Again, refer to my introduction! This is when you’ll need de-icer and the ice chipper / sharp edged shovel. After removing the snow, if faced with a layer of ice, you’ll need to go at it by chipping away. You can also throw down a layer of de-icer but Bob Vila recommends another option for stubborn spots: Get a spray bottle and fill it with two parts rubbing alcohol and one part warm water. Spray the areas liberally that you will need to chip away at and wait a while. It should help to break down the ice enough that you’ll be able to clear what’s left with relative ease. While many people still use it—to the tune of five million tons of it annually—rock salt is not not safe for the environment. It can damage your lawn, garden and contaminate water supplies, which can ultimately harm animals too. There are many more ecologically friendly products that are safe for all sorts of walkway / driveway surfaces and many are even safe to have around kids and dogs. After all, they do tend to lick their paws a lot. The dogs, not the kids. And more importantly, these products are safer for the environment, including during spring runoff when they get mixed in with water supplies and sewer systems. If you need some traction, even temporarily, on a particularly slippery spot, you can throw down some sand or gravel but remember to clear it away before spring as it can clog up water drainage areas and sewers. Use de-icer products sparingly. They won’t work faster if you spread on a thick layer but that’s one way to empty your wallet quickly, if that’s your plan. And pay attention to the temperature ranges that they can handle: each product is different. For those of you who are redoing your walkway or driveway and have some serious wherewithal, you might want to consider In ground heat mats, with underground radiant heating (something like what you might have in your bathroom or basement flooring). For a less expensive solution, there are above ground electric heat mats, which are said to cost about $1 per winter day. For a member of the family who can’t shovel, this might be cheaper than a snow removal service and something worth considering. 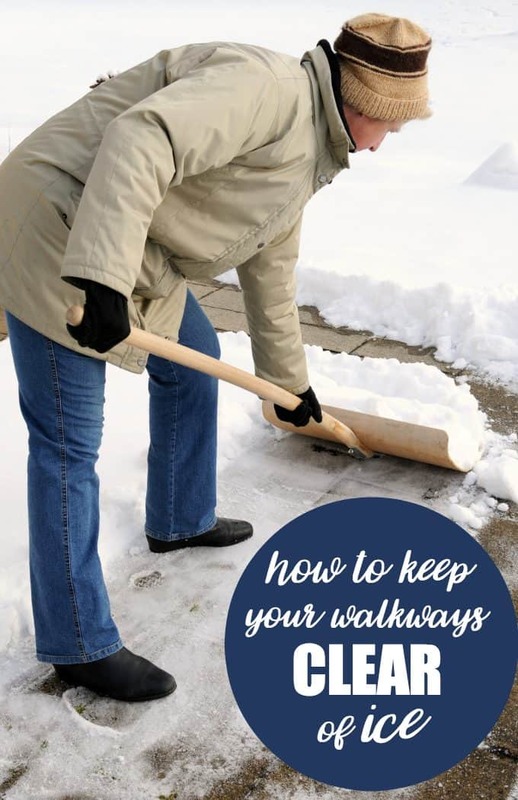 What do you use to keep your walkways clear of ice? Any special tips or tricks you would care to share? I have not had to shovel and keep the walkways clear of snow yet! But it will snow and we will get some. I plan to shovel regularly to keep up so it does not get to heavy. And having a snow blower really helps so much with shoveling! We’re in downtown Toronto and it always amazes me the number of people who do not shovel their walkways properly! Some great tips! We are getting blasted with snow for the first time this season today,. We’ve only had a few times where it has ice/snowed so bad I had to shovel. I’m glad it isn’t more than that. Thanks for the tips- I’m definitely going to need them this winter! As I don’t live in a city that frequently deals with snow, I do appreciate your tips for those times when it does fall. I was not aware that salt rock is detrimental. It has been our go to product up until now. Thank you. My husband shovels or uses the snowblower to keep the snow and ice under control. We never use salt since it damaged some of our front step a few yrs ago.